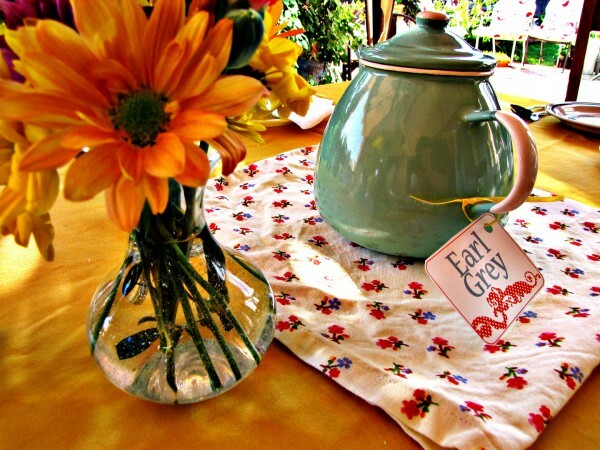 Tea party inspiration and a giveaway! 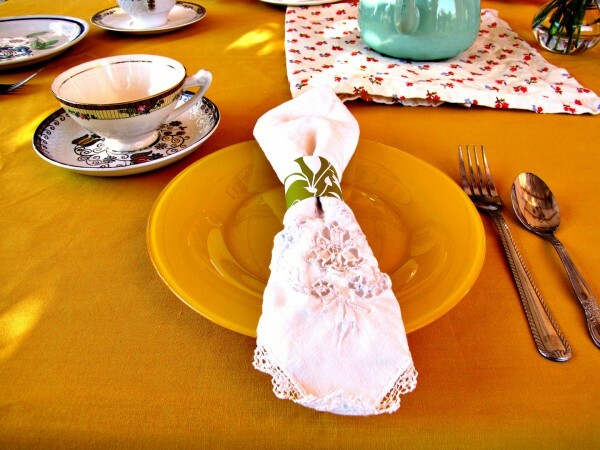 Earl Grey tea, Peach tea, and Indian Spice Chai were all served at the table. I love this vintage metal tea pot, but the handle was scalding hot! All of our decorations were vintage and handmade. We were going for a very colorful and bright look. 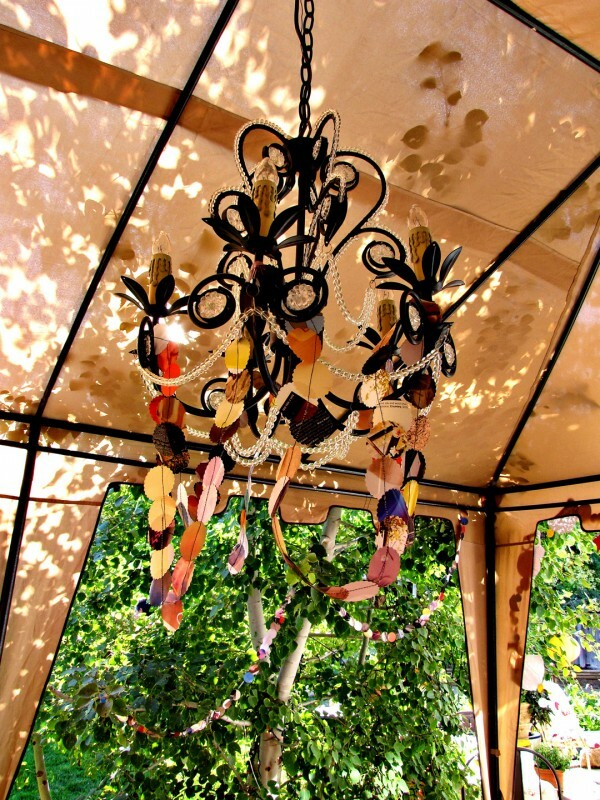 The table was set up under a tent and we used lots of paper decorations, including these simple cut outs that we sewed together. We used old magazine pages which added a lot of color, and we love how they turned out. Our food table. Lemonade, vintage trays, fresh flowers, cake stands, Anthropologie latte bowls, and pretty food labels on skewers were used. I love the rustic feel of these bacon and onion tartlets. Coffee cake, lemon cake, blackberry napoleons, truffles. 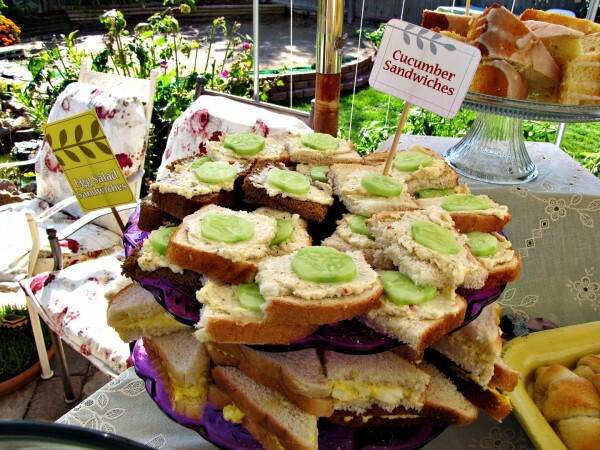 Egg salad sandwiches, cucumber sandwiches, croissants. 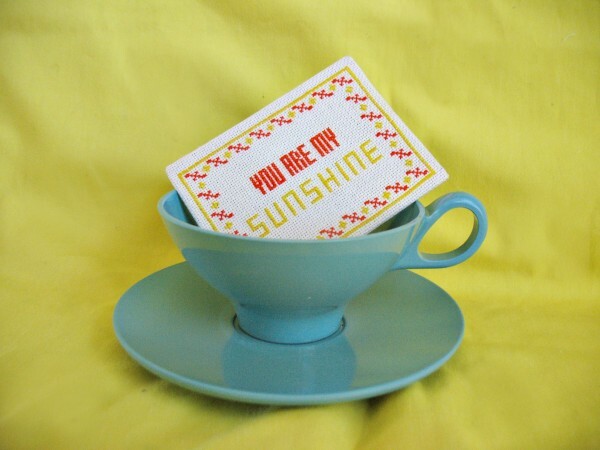 MayDae is giving away this ultra cute Melmac cup and saucer, and this vintage hand embroidered sign that says: You Are My Sunshine. Aren’t they adorable? 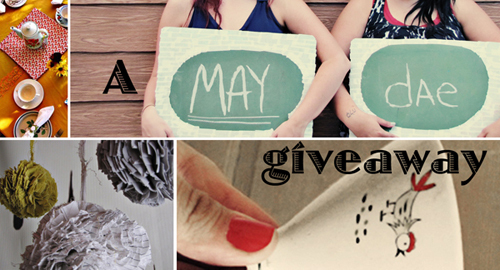 All you have to do to enter is leave a comment on this post (one comment per person). We will pick one winner at random on Monday, August 23rd, 2010 at 5:00 p.m. MST. Any comments left after 5:00 p.m. will not be eligible. Giveaway open to U.S. residents only. Happy commenting! I haven’t had lunch yet! Now I’m really hungry. 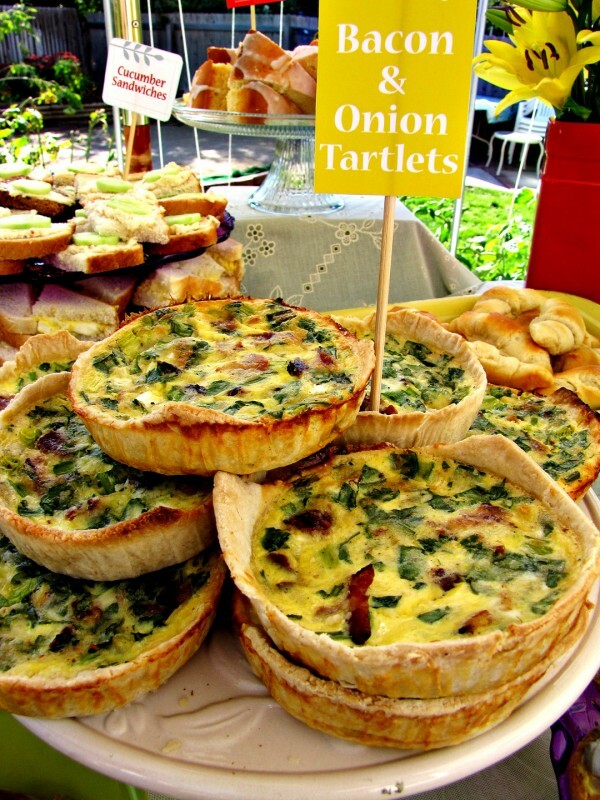 The bacon & onion tartlets look delicious. 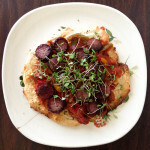 Do you have the recipe to share? I love how inspired you both are! It is so fun to see what you have on your website, and you have done a great job! Oh how cute! I love the yellow! And the teacup is adorable, too. I bet the morn/afternoon tea actually took all afternoon!! Haha! That’s awesome! Oh how cute!! I love teacups!!! They are so pretty and this is one of my favorite colors!! Aw this is so cute! I love teacups! Now I want to have a tea party of my own! you are such creative girls – what an amazing tea party! Everything looks beautiful and yummy. First, I had to clarify between myself and the other Elise ;) Also… I LOVE you guys… duh. And I have an idea. It’s really awesome… when I come there next time I will tell you all about it. But what I’m trying to say, is, it’s an idea that I need you two to come decorate for :) That’s all. Happy winner picking! Please exclude me from your wonderful competition and if my name comes up the winner please pass me up. I’m just posting to thank your site for being a continual colorful, blast of inspiration during the dull, boring work week. Keep up the Ah-Mazing work! That is the perfect tea cup for my teacher desk!! That is so cute! All those pics of the lovely food made me so hungry lol. Yep… you two are fabulous! I LOVE this cup! It will go so well with my unmatched tea set (that I use daily). It whispers elegance and femininity and pulls on my heart strings! Thank you for this splendid give away. What great pics! Hope I win! I LOVE the fun bright colors that make all ladies HAPPY! 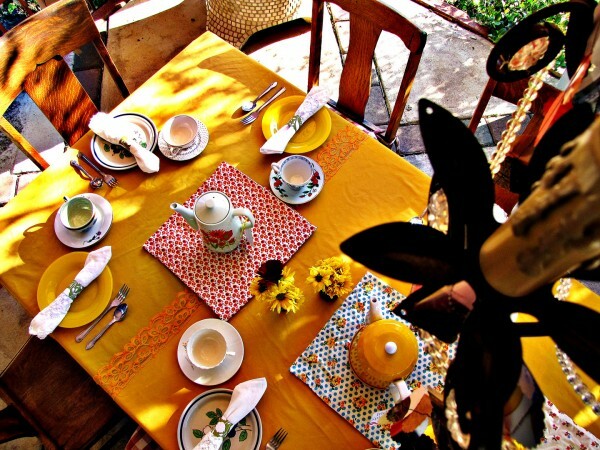 That tea party looks amazing :) And so does that teacup. 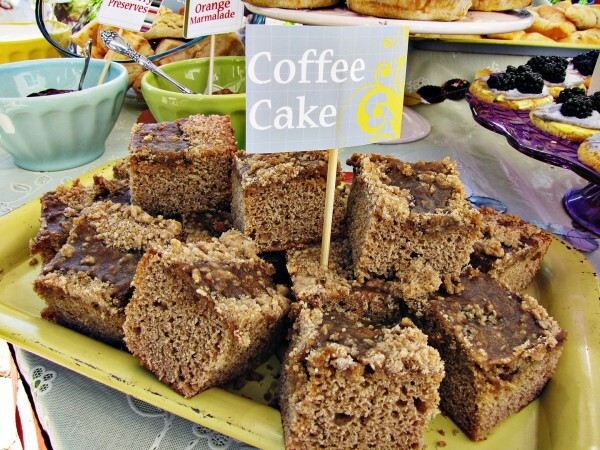 An airplane ticket would have been worth it to be an attendee at your wonderful tea party. Love your creativity and love you! how pretty the party turned out! and i LOVE the hand embroidered sign! :) thanks for the chance to win! 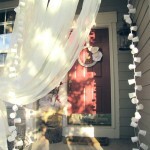 I love tea parties, tea shops and how grown up it makes you feel, don’t you? Awww! My roommate used to sing “you are my sunshine” whenever I would try to cheer her up. Sweet huh? I love it so cute! 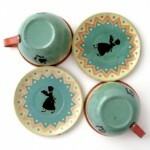 I adore teacups and would love to give the You are my Sunshine to my best buddy for always cheering me up! Your tea party looked like so much fun. Thanks for sharing. Your creativity is inspiring. Love it. And of course I will win or come close because I always win things. You have to believe, right? Be blessed. 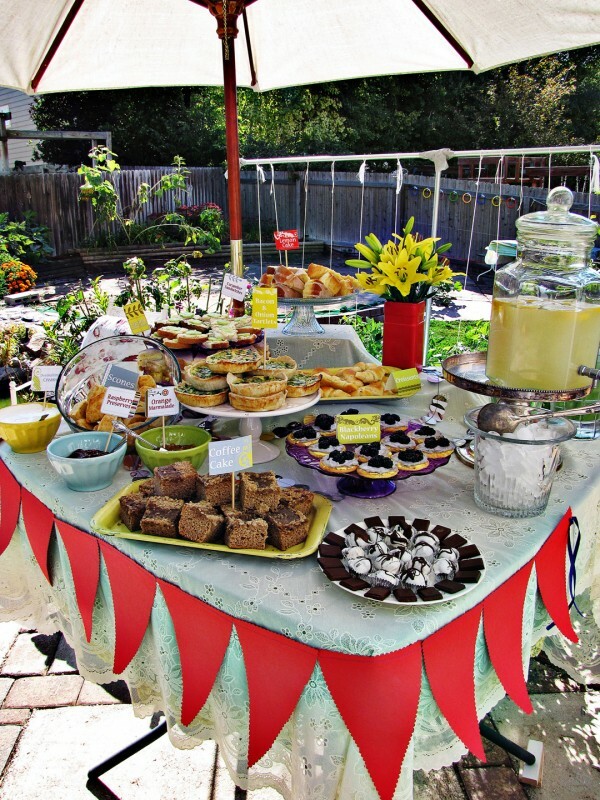 The tea party pictures look so lovely! 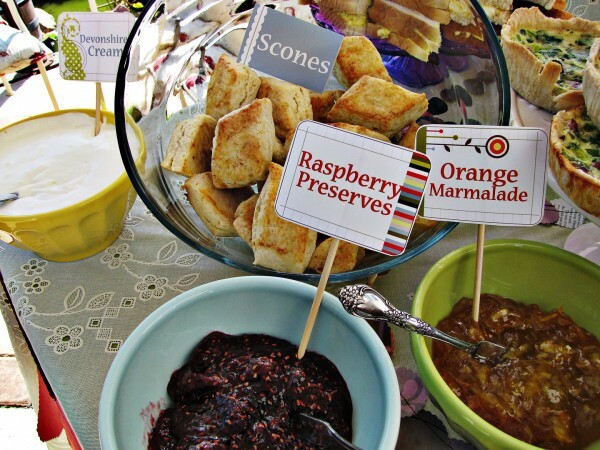 I love the scones and jam, and the decorations are lovely! Now I’m hungry! Thanks for the giveaway; I LOVE the cup and saucer! I love melmac! 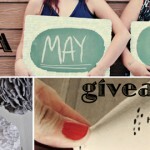 Fingers crossed… Thanks for the giveaway! This is very beautiful! You must have had a blast!!! My mom, sister and I have a tea party yearly for our daughters and my grandma who is about to turn 81!! Hope others can have a wonderful time with this as well! This is adorable! Hope I win. I absolutely love this. I am obsessed with tea sets! I hope I win! So cute! Thanks so much for this giveaway! This is adorable! :D Nice giveaway. that tea cup is so cute! Looks like I am just making it time wise for this contest,. I love the cup and saucer!